The first TNR of 2018 will be on April 3rd, and I’m excited to be promoter and race announcer for TNR this year. In my opinion, the primary goals of TNR should be that it is safe, fun, and a good workout*. Additional goals should be to grow the track cycling community and to provide racing experience for up and coming riders. Finishing up by 9PM or pretty damn close to it. Providing training opportunities for riders training for championship events. When there is a 5th Tuesday, we’ll see what happens. I believe that this schedule provides a good mix of racing. The second Tuesday sprint category will be for riders who primarily train and race for sprint events, and riders may not race both mass start and sprint events. The 4th Tuesday provides an opportunity for madison riders to race their favorite event, while providing short races intended for non-madison racers, that also attracts some sprint oriented riders. This is the only night when A/B categories do not get 100 laps, but the madison racers get plenty of racing, and the other A and B racers still get plenty of racing with an opportunity to race in shorter events. Below is the tentative schedule for April and May. I’m sure some lessons will be learned in April and May, and the schedule for the following months will reflect those changes. We may institute a points competition of some sort from June- September, but only after assessing the first two months of the season. Below is the TENTATIVE Schedule for the first 8 weeks of TNR. I consider this a smooth draft. Things will change, we’ll have to wait and see how much. Final schedules for each night should be available only no latter than the Friday before. I'm open to rider feedback both before we start racing, and once the season starts. If it's respectful and useful, I'll always take racer concerns into account. I’ll see you on Tuesday nights. B Grade 6-lap scratch race. B Grade 8 lap Tempo points race. Aces 12 lap Tempo points race. B Grade 3K scratch race. Women who qualified to race A or B categories may choose to race those categories. B Grade 4K scratch race. B Grade 4K Tempo race. B Grade 7K scratch race. Heats will be 5-10 riders per heat, with 2-3 moving on to the semi and then same for final. Total Number of heats, riders moving on, etc will depend on total number of entries. men’s and women’s team competition, along with the women’s individual competition in 2017. Santos (USA) Isaac Howe (USA), Olivier Leroy (FRA) and Chris Tolley (USA). helmets, shoes, and all other clothing, while ROKA will provide eyewear. The team will cut down on travel expenses by using the Orucase Airport Ninja cases for all flights. The Red Hook Crit Men’s race might never end with a field sprint again.” At least that was my prediction the day before Red Hook Crit London #3. Much of the team agreed with me, and it wasn’t a risky prediction. After all, the last time the men’s race finished in a field sprint was 2 years ago, at RHC London #1. With rain in the forecast and some heavy hitters in both the men’s and women’s races, we fully expected both races to end in a breakaway. The plan was to be on high-alert from the start to ensure we make the early breakaway. But first, we had to make it through the qualifying heats. The new qualification scheme with actual races is good for us as a team. All of our men and women are easily capable of getting into the top 5 of their heat and getting a good starting spot on the grid. But things happen. There are no free laps for mishaps like there are in road bike crits, and wet roads equal flats and spills. Isaac was our first qualifier and finished 5th in his group, so he would be headed for the super pole. It didn’t go so well for Tristan and Dave. Tristan was nervous after running over another rider during the practice session. That session left Tristan unscathed, but shaken up. He simply wasn’t himself and finished 11th in his heat. Dave was looking strong in his heat and his group of 7 lapped the rest of the field. But my heart sank when the finishers sprinted across the line and Dave was nowhere to be seen. Dave took a pretty hard spill and went over the barriers on the last lap. Luckily, his injuries were minor and since the rest of the field was lapped, he finished in 7th place. We finished the men’s qualifiers on a strong note as Olivier easily won his heat. All three women were in the first women’s heat. Torrential rains started almost immediately after the race began, and the women raced around the circuit in a downpour. Luckily, everyone stayed upright and the team exhibited near perfect tactics to make sure Eleonore won her heat, with Sammi in 4th and Kym farther back. Rain is almost always good for a breakaway, and riding in a small breakaway is safer than riding with a huge pack. The super pole was canceled, but Eleonore and her custom painted Aventon Cordoba started in 2nd place, with Sammi close behind. The plan was to put Eleonore in an early move where she would be safest and where she would also have a chance to pick up some mid-race prime points. Sammi would be there to help her out and chase down a move if we missed it. Sammi hit the deck on lap 4. She was fine and she hopped back up to chase, but the crash caused a flat and she was done. Kym was struggling near the back of the group, so Eleonore was all alone. Eleonore looked cool, comfortable, and in control the whole race. In fact, an examination of lap times and placements by Chris Tolley shows that Eleonore was in the top 5 racers for all, but 3 laps. Despite efforts by Dani King, Eleonore, Tanja Erath, Jasmine Dotti, and others, no breakaway group managed to survive. Eleonore was positioned perfectly in second wheel with 1 to go. Raphaele Lemieux attacked on the back side of the course and was first into the last corner. Eleonore was charging hard, but ran out of room and couldn’t quite come past Lemieux. Second place again. Olivier was our best placed rider in the men’s race and claimed #2 on the starting grid. Isaac was around 20th while Dave and Tristan started in 28th and 45th. Once again, we would be looking for a breakaway. While Dave and Tristan slowly worked their way towards the front of the race each lap, Olivier stayed near the front and was attentive to any possible breakaways. Isaac is still trying to figure out fixed gear racing, and was holding steady near mid-pack. Olivier looked great the entire race, and by about 10 laps in, I could see that he and Dave would present our best chance at the podium. 19 laps in, there was a huge crash and 3 of our 4 went down. Luckily, nobody was badly injured, and the pileup caused a restart. Unfortunately, the crash happened just as David was nearing the front, and this was his second crash of the day. Tristan wasn’t his usual self, Issac was struggling, and Dave was done. But luckily, Olivier was looking as strong as ever. He took the mid-race prime and wasn’t the slightest bit fazed. He stayed consistently in the top 10 and looked like he was preparing for the final sprint. With 5 aps to go, he flatted. Olivier was done. The race finished in a field sprint, won by Filippo Fortin, while Tristan and Isaac finished 17th and 38th. Our worst men’s finish in over 2 years. We had a little good luck and a little bad luck in London. But Eleonore got us on the podium and still holds the leader’s points jersey by a point and the women’s team took a commanding lead for the women’s team competition. It will be a battle between Saraiva and Lemieux in Barcelona for sure. The men will be itching to redeem themselves at Red Hook Crit Barcelona #5, and they’ll be looking to improve Tristan’s 2nd place finish from last year. Track class begins in July! The first day of my track class at the San Diego Velodrome start son July 12th. After 8+ months of track closure, everyone will be itching to get out there. So wether you are an experienced trackie, or you want to learn to ride the track, sign up soon before class fills! What Crank Length and Gear Should You use for Fixed Gear Racing? What Crank Length and Gear Should You use for Fixed Gear Racing? Riders often agonize over their choice of gears. They spend hours thinking about: “ What gear should I use for my race.” Gear choice is especially important on single speed and fixed gear bikes. Tack racers, fixed crit racers, and urban fixed riders have an important choice to make, because once they’ve made that choice, they are stuck with it for the rest of the ride. 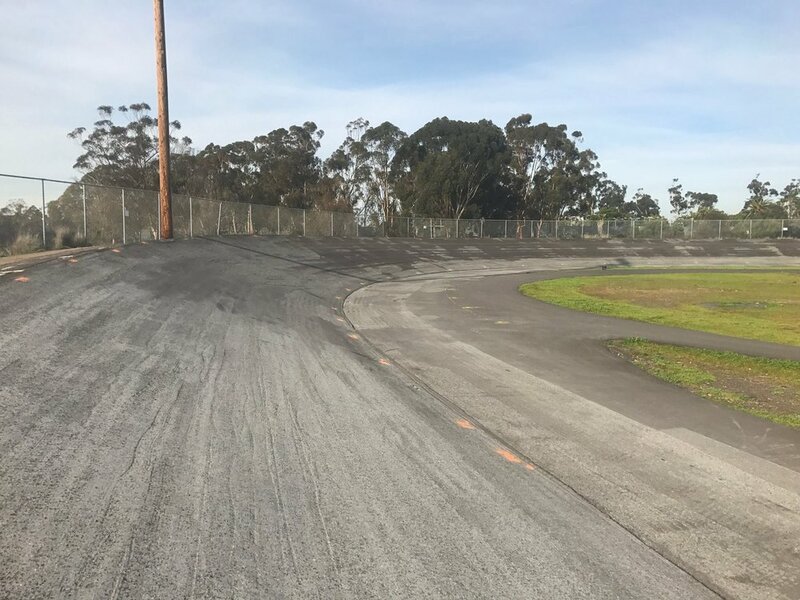 3/27 Velodrome Resurfacing update. We are now at the end of March, and we expected to be done by now. So what's the scoop? So here is what I know, or think I know about the current state of the track surface. I'm not an SDVA board member, and I'm not managing the project for the SDVA. So you can consider all of this hearsay, conjecture, and educated guessing. In January, I wrote a post about what was going on with the track resurfacing. If you haven't read that, it's a great place to start. It explains the problems with the first contractor, and suggested that the track would be open by mid-March. Of course we are in the last few days of March, and the track still isn't open. There are a few things that caused additional delays. If you live here in San Diego, you know that we've had record rains in the last couple of months. The rain prevent work from being done on the actually rainy days. But also left the infield soil so wet, that the heavy equipment required for the job simply couldn't operate. On top of that, the possibility of legal conflict with the original contractor meant that a representative from the city and/or parks department asked the SDVA to cease work for a short time while city of SD representatives examined the situation. Once the go-ahead was given from the city/parks department and the infield was sufficiently dry, the crews at Hazard construction returned to work. I've stopped by a few times and watched the crews at work measuring and leveling the surface. I believe that t the next step is to put a smooth layer of asphalt on top of the existing level surface, and that is starting this week. That is really the difficult part. After the smooth surface is laid out, it's just a matter of measuring and painting the lines, and the re-installing the fence at the top. These things take a little time, but aren't inherently complex and should go off without a hitch. I'm hoping that the track will be rideable in the first half of May, so keep your fingers crossed on that. In the meantime the Spring Veloswap is scheduled for April 23, and even if the track isn't ready to ride, theVeloSwap is a go! What is happening with the San Diego Velodrome resurfacing? The bid was accepted and the contractor got to work, the expectation was that the resurfacing itself would take only 4 days. There are frequently delays in construction project, as things seldom go perfectly to plan. But the contractor ran into problem after problem, most of them generated by his own mistakes. Days became weeks, and he did not appear to be making any progress. It almost seems that the more he tried to create a nice, smooth surface, the worse it became. After ~ 8 weeks and with the track in worse condition than before, the contractor was asked to leave the job. Mark Ainsle has been project managing the job for the SDVA and has put in many hours to get this job done. When it became obvious that the original contractor was not capable of doing the job, Mark searched far and wide a contractor or expert with appropriate experience that would be willing and able take on the challenge. But there simply aren't a whole lot of construction companies that have the right experience for this sort of project. And of the few that do, none of them were willing and able to come to San Diego for the work. Eventually, Mark connected with some executives at Hazard Construction, a large, local, San Diego company. Hazard does not have experience resurfacing velodromes, but they are a huge company with the experts, engineers, and equipment to get the job done. It appears that the Hazard Construction executives take personal pride in the project as well. The resurfacing was scheduled to be finished the first week of February, but that was before our most recent rains. My guess is that the completion date will shift by a week or so. Even if we add another week for more rain or unexpected delays, that still leaves plenty of time before racing typically starts and before the first scheduled adult classes begin in mid-March. I'll post class registration links as soon as I'm confident that the track will be open. Just email me: Sean@crankcycling.com if you would like top be put on the mailing list and get an alert when registration opens. Thanks to Mark Ainsle for putting in MANY hours of work on the resurfacing project. I'm sure he'll be as happy as anyone when the whole thing is finished! Now is the time to think about the 2017 season. A strong winter foundation is a great way to prepare yourself for your best season ever. An even better reason to start thinking about training for 2017, is that now through December 25th, you can start your coaching with no start up fee, a savings of up to $250. Additionally, with an optional annual commitment, you can get 10% off the monthly rate. You can check out coaching rates here. Or email me: Sean@crankcycling.com with any questions. I've got som cool new stuff on the Appetite 4 Adventure website and Youtube Channel. Most recently, James has showed us a quick look and review of the Knog Oi Bike Bell. I did a quick unboxing and first look for a long term review of the Outdoor Tech Buckshot 2.0 Bluetooth Speaker. We also have our first look at the 3T Exploro bike, and we hope to get one for a long term review. I love motorbikes almost as much as I love bicycles. I have a couple of motorcycles, but the easiest one to carry my bicycle on is my Aprilia Scarabeo scooter. Check out this video I made about how to carry your bicycle on the scooter, you can also use this system with motorcycles of course. Dropping your pants in the parking lot to change into your kit just isn't a very nice thing to to you your neighbors. You can wrap a towel around your waist, but Its comfy, it works better than a towel, and it makes the car ride home oh so breezy! Pro Cycling on $10 a day. Phil Gaimon tells so humorous stories about his fast ascent into the pro peloton. He'll make you chuckle, and he'll make you realize that you probably didn't want to be a pro bike racer anyway. Pebble smart watches start at just $69.99, but my recommendation is to go for the $149 Pebble Time What I find most useful about the Pebble is that when you get an incoming text, you can just glance at your wrist to read the message. If the message is important, you can answer it. If not, you worry about it later. Click on the pic to read a view on geekwire.com or go straight to pebble.com to buy one. Greenville Cycling & Crank Cycling are joining up to bring you a world-class training camp in sunny Southern California in Winter/ Spring, 2016. Based in Carlsbad ( North County San Diego), this camp will provide the enthusiast rider and the avid racer an opportunity to train out of a relaxing seaside resort, the Carlsbad Inn. We’ll blend a variety of rides up and down the beautiful SoCal coast along the Pacific Coast Highway with awesome rolling rides around northern San Diego County including an excursion into the mountains in East County San Diego. This cycling camp will not only provide you with some great days on the bike, but you'll have some great times off the bike as well. Off the bike you can enjoy the trendy cafés and restaurants of Carlsbad Village just steps from the Pacific Ocean. Camp routes will test your fitness and skills; however you'll be on the road with some of the top coaches in the country. We are right there to answer any questions you have and each evening we have Coach Time where you can review your power files, map out a training plan, or ask nutrition or equipment questions. Power Training Camp Option: Each evening a coach can review your files with you and answer any questions you have. If you don't have a power meter and would like to learn more about training with power, rent a PowerTap wheel for the duration of camp! Take your training to the next level and learn more about training with power! WEATHER: San Diego, CA has wonderful weather all year long! February has average low of 51 degree and high of 65. Humidity is relatively low. Double Occupancy $2499, Single Occupancy $3299 Day camper fee $250/day • A $500 deposit is required at time of registration. 10% (of total camp cost) cancellation fee applied to any cancellations. Cancellations accepted up to 30 days prior. Final payment is due three weeks prior to camp and at this time all payments are final and non-refundable. What Causes Exercise Induced Cramps? Not what you think. Muscle cramps are the enemy. Just when you were having a great race, on your way to a PR, and pushing your limits like never before, you get a cramp that forces you to slow down, or may leave you unable to continue. Athletes have likely been searching for the exact cause of (and thus a way to prevent) exercise associated muscle cramps (EAMC) since before the Olympic games in ancient Greece, but the fact is that we still don’t fully understand the mechanism that causes cramps. One thing we can be sure of, or as sure as we can be of anything proven by science, is that muscle cramps are not caused by electrolyte depletion or dehydration. This seems counter-intuitive to many, the notion that cramps are caused by dehydration and electrolyte depletion has been around for a long time and has been repeated so many times that it many simply accept it as fact. This is probably because athletes that suffer cramps are frequently drenched in sweat and covered in salt, so there does seem to be some anecdotal evidence for the correlation. However the fact is that there is no known mechanism by which sodium depletion or dehydration would cause cramps. Additionally, there is little evidence to support the theory that the loss of sweat is actually responsible for the EAMC, and a large amount of evidence to refute it. A quick search of the scientific literature generates several studies that show essentially no difference in the water or electrolyte losses of athletes that cramp, vs those who don’t cramp . The research of the last decade or so has led to an acceptance among exercise researchers that electrolyte loss and dehydration are not the cause of EAMC. But if losses due to sweat aren’t responsible for cramps, then what is the culprit? The current school of thought is that cramps are primarily due to “altered neuromuscular control” due to fatigue. While studies have shown that water and electrolyte losses are NOT associated with cramping, there are several factors that are definitely associated with EAMC, including lack of fitness, pre-race muscle fatigue and athletes simply pushing themselves harder than usual. The simple and effective treatment of stopping to rest and stretching the muscle likely gave researchers some of the first clues that dehydration was not the cause of cramps. After all, stretching and rest does nothing to help with hydration or electrolyte levels. The altered neuromuscular control theory truly began to take hold in 1996, and the evidence for theory has grown, as has the evidence against the dehydration/electrolyte theory. There are a few different plausible theories for exactly how this “altered neuromuscular control” causes cramps, and as is typical, more research needs to be done. But the point is that there is a mountain of evidence to show that electrolyte depletion/dehydration is out, and general fatigue is in. Does that mean you should skip the electrolyte beverage? Absolutely not. The American Dietetic Association, The American College of Sports Medicine, and Dieticians of Canada all recommend a carbohydrate/electrolyte beverage during prolonged exercise. Dehydration due to lack of fluids, and hyponatremia due to sodium loss can be not only detrimental to performance, but deadly. So I recommend that all my athletes use a carbohydrate/electrolyte drink during all rides longer than an hour. The most important thing about one of those beverages is that you like the taste and you’ll dink it. It isn’t doing any good just sitting in your bottles, it has to find its way into your stomach. I’m sponsored by Powerbar and I enjoy the taste of their lemon-lime Ironman Perform, so that’s what I put in my bottles, and in my stomach. The carbohydrates and the electrolytes will help replace what you use and what you use. But they won’t protect you from cramps. It won’t keep you from cramping, but drink it anyway. Bonus: Some people have asked me about pickle juice to prevent cramps. There is actually some strong evidence that pickle juice can help relieve cramps, and while researchers have typically used juice from a plain old jar of dill pickles, companies have been quick to sell pickle juice that is specifically marketed and packed for endurance athletes. Pickle juice is high in sodium, but it does not appear to be the sodium that helps with the cramps. The pickle juice works so rapidly, that the sodium does not have time to enter the stomach and then the bloodstream. The most likely theory is that the acidity of the vinegar has an effect on the nerves at the back of the throat that somehow blocks the cramps. As is typical more research is needed to determine the exact mechanism. I’ll buy a bottle that also comes with the pickles! 1)Med Sci Sports Exerc. 2005 Jul;37(7):1081-5. Serum electrolytes in Ironman triathletes with exercise-associated muscle cramping. Sulzer NU1, Schwellnus MP, Noakes TD. 2) Br J Sports Med. 2004 Aug;38(4):488-92. Serum electrolyte concentrations and hydration status are not associated with exercise associated muscle cramping (EAMC) in distance runners. Schwellnus MP1, Nicol J, Laubscher R, Noakes TD. 3)Br J Sports Med. 2011 Jun;45(8):650-6. doi: 10.1136/bjsm.2010.078535. Epub 2010 Dec 9. Increased running speed and previous cramps rather than dehydration or serum sodium changes predict exercise-associated muscle cramping: a prospective cohort study in 210 Ironman triathletes.Schwellnus MP1, Drew N, Collins M.
4)Br J Sports Med. 2009 Jun;43(6):401-8. doi: 10.1136/bjsm.2008.050401. Epub 2008 Nov 3.Cause of exercise associated muscle cramps (EAMC)–altered neuromuscular control, dehydration or electrolyte depletion? Schwellnus MP. 5)Sports Med. 2007;37(4-5):364-7.Muscle cramping in the marathon : aetiology and risk factors. Schwellnus MP. J Athl Train. 2009 Sep-Oct;44(5):454-61. doi: 10.4085/1062-6050-44.5.454. 6)J Athl Train. 2009 Sep-Oct;44(5):454-61. Electrolyte and plasma changes after ingestion of pickle juice, water, and a common carbohydrate-electrolyte solution. Miller KC1, Mack G, Knight KL. 7)J Am Diet Assoc. 2000 Dec;100(12):1543-56. J Am Diet Assoc. 2000 Dec;100(12):1543-56. Position of the American Dietetic Association, Dietitians of Canada, and the American College of Sports Medicine: Nutrition and athletic performance.